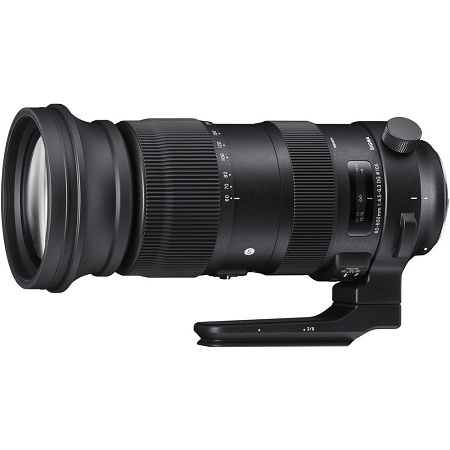 A single zoom covering a huge 10x range, the Canon EF-mount Sigma 60-600mm f/4.5-6.3 DG OS HSM Sports Lens is a versatile optic well-suited for a variety of subjects, including portraiture, sports, and wildlife. Its advanced optical design incorporates one SLD element and three FLD elements, which help to greatly suppress chromatic aberrations and color fringing throughout the zoom range for improved clarity and color accuracy. A Super Multi-Layer Coating has also been applied to individual elements to control flare and ghosting when working in strong lighting conditions. Complementing the optical performance is a Hyper Sonic Motor that provides quick and a quiet autofocus performance, along with an Intelligent OS system that minimizes the appearance of camera shake by up to four stops. The physical design of the lens also incorporates several seals to guard against dust and moisture, and a water- and oil-repellent coating has been applied to the exposed elements to prevent moisture, fingerprints, or smudges from sticking to the surface.